Boris Johnson and Priti Patel who were the UK Foreign Secretary and International Development Secretary respectively have announced yesterday that the government of United Kingdom will donates total sum of 200 million pounds to assists the indigenes of the North-East region of Nigeria who were affected by Boko-Haram’s insurgency. Boris Johnson announced the donation of 200 million pounds to Boko-Haram Victims in Northeast, Nigeria in a statement when the two secretaries visited Borno on Wednesday to see how UK can top international response on the humanitarian crisis in the North-East. 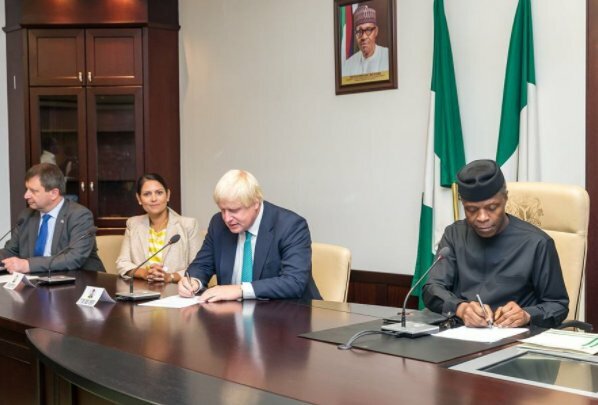 The UK foreign secretary said that their visitation was focused on helping the indigenes of the North East to abolish famine and build stability and security after the destruction caused by Boko Haram in the region. Boris said that the UK’s response in the region would include both security and humanitarian efforts on the secretaries’ first joint visit to Nigeria. The UK foreign secretary added that both secretaries saw first-hand how British military had been providing more training to Nigerian soldiers fighting Boko Haram on the frontline. The £200m which is donated to Nigeria is an allocation of Department for International Development (DFID)’s budget for four years from 2018 to 2022. The International Development Secretary Priti Patel had announced that the programme was built on the UK’s existing 100 million pounds of humanitarian support for 2017. Patel also emphasized on the fact that £200m donation and the dedication of the United kingdom government would serve as a lifeline to over 1.5 million people in the Northeast region of Nigeria. The programme comprise lifesaving food for more than 1.5 million people on the brink of famine will include treatment for up to 120,000 children at risk of dying from severe acute malnutrition. It will include ongoing support to help keep 100,000 girls and boys in school to get a decent education, providing a brighter future for the next generation. Also, safe humanitarian access to transport brave aid workers and deliver aid to the hardest to reach areas, for example using helicopters where roads are blocked or dangerous to use.